Prime Minister Narendra Modi on Monday launched the Sahaj Bijli Har Ghar Yojana ‘Saubhagya’, the scheme for secure electricity to every home. Addressing at the launch of the scheme, Modi promised to complete electrification in the country, saying an amount of Rs 16,000 crore has been allotted to bring about a significant change in the lives of the poor. The connections will be delivered at the doors of the rural poor for which they would not have to go after the government officials, every house, whether in the village, town or a remote area, will get power. No poor man will have to pay anything for it. Officials will approach villages and offer services,” the prime minister said at the launch organized at the new office of ONGC, named after RSS ideologue Pandit Deendayal Upadhyaya. Modi stated that out of 250 million households in the country, 50 million still have no access to electricity. The total expense of the Saubhagya Yojana has grasped at Rs 16,320 crore, and it will be funded primarily by the government at the Centre. The Yojana will include access to electricity to all willing households, substitution to kerosene, improvement in educational and health services, improvement in communication and public safety. The scheme will also bring in increased job opportunities and better quality of life, especially for women in daily chores. Remote villages will be powered by solar panels along with five LED lamps, a DC fan, and a plug point along with servicing and support for five years, the govt said. 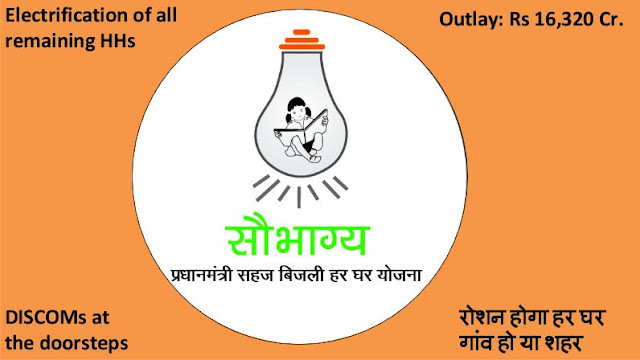 Under the ‘Saubhagya’ scheme, electricity connections will be given free to people identified by the Socio-Economic and Caste Census of 2011, while others will get it for Rs 500, payable in 10 installments in the bill, a government statement said. The scheme promises on-the-spot registration of applications, which should include an identity proof. The scheme supports the government’s mission to take electricity lines to every village in the country, including solar power stations in remote communities. About 90% of the non-electrified households are in Bihar, Uttar Pradesh, Maharashtra, Madhya Pradesh, Odisha, Jharkhand, Rajasthan, Karnataka, J&K and North-Eastern State. Midi , Modi and Modi person with revolutionary ideas . I just think how could a person be such a big productive ideas . Praise his ideas .